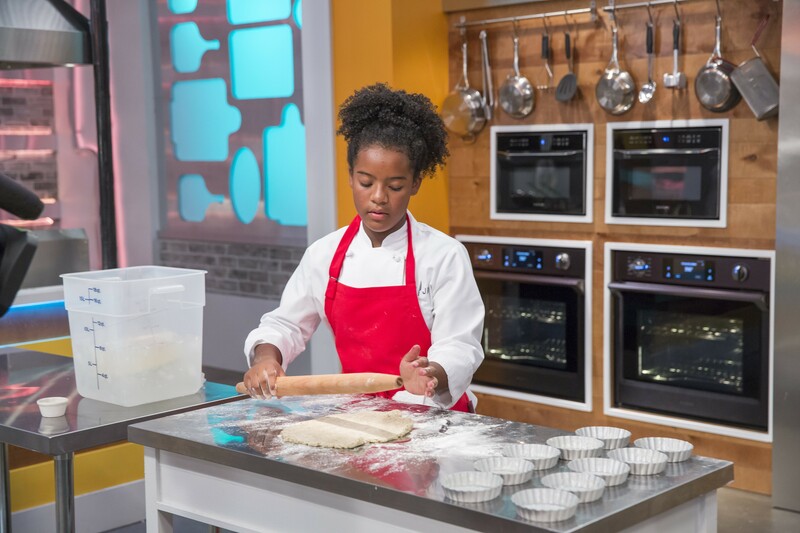 Oakland Native Rahanna Bisseret Martinez Nearly Wins Top Chef Jr.
Rahanna Bisseret Martinez rolling out her black pepper pie crust. Culinary competition show Top Chef recently launched a spin-off for kids, and Oakland's 13-year-old Rahanna Bisseret Martinez almost snagged the title. Top Chef Jr., which aired on Universal Kids, pitted 12 young chefs ages 11 to 14 against each other in a range of challenges with head judge Curtis Stone, the celebrity chef and restaurateur. Martinez finished second in a neck-and-neck finale to 14-year-old Owen Pereira of Maryland, who took home a cool $50,000. While judges adored Martinez's pecan sweet potato pie with thyme ice cream, cajeta (goat milk caramel), and a black pepper crust, they ultimately found her first course, a lobster-butternut squash soup, a bit muddled. What was most remarkable about watching Martinez calmly execute her meal — with tweezers for plating — was knowing that she’s entirely self-taught. Martinez said she has been helping her mom cook since as far back as she can remember, although she distinctly recalls roasting butternut squash at 8 years old and watching the color change. With family roots in Louisiana and Mexico, Martinez prepared a unique mix of Creole and Mexican food on Top Chef Jr. Now, she is enrolled in culinary school while continuing her home school education and still finding time to cook two to five hours every day. Martinez said she loves the diversity of food and cultures in Oakland, which influences her cooking as well as the proliferation of farmers’ markets and fresh produce. Two of her favorite local restaurants are Brown Sugar Kitchen and Souley Vegan. “It’s really cool here because a lot of people eat plant-based things,” she said, adding that she was vegetarian for three years. “I don’t know why I stopped, but I did,” she said with a laugh. After culinary school, Martinez wants to write a book, open a restaurant, and continue to inspire children that they, too, can interpret food like a fine dining chef.